Highways England has announced the launch of a new road safety campaign aimed at clamping down on the irresponsible behaviour of some motorists that undertake gritter vehicles on the nation's roads. Transport minister Andrew Jones highlighted the growing problem during a visit to the organisation's Coleshill depot earlier this week (October 26th). Gritter drivers at the depot told the minister how some road users are veering into the hard shoulder to undertake gritters to avoid being struck by salt and grit as these vehicles carry out their essential task of keeping the country's highways free from snow and ice. According to the government's road safety statistics, 16 people on average lose their lives every year as a result of collisions on hard shoulders or in motorway laybys. It is therefore essential that all road users abide by the rules of the road and only overtake when it is safe to do so. 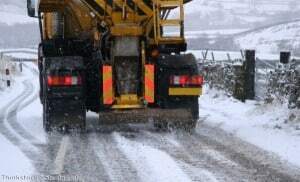 They should only ever overtake in the correct outside lane of gritter vehicles, while they should also drive carefully and ensure they are maintaining proper concentration to avoid potential hazards in the road ahead. Mr Jones stated: "Transport is absolutely critical to our thriving economy, which is why we need to ensure the network can cope with winter weather. Highways England will be working around the clock to keep our major roads clear. "The government is also closely monitoring resilience across road, rail and airports to ensure Britain can keep moving in the event of extreme weather."